Laser Therapy has been used for decades in equine veterinary medicine and therapy to help treat a wide variety of conditions in horses young and old. It is used as a standalone therapy or in conjunction with other therapies and/or pharmaceuticals. The applications of laser therapy for conditions ranging from wounds to chronic arthritis and debilitating diseases make it an extremely versatile therapy, and it is becoming increasingly common in barns around the world. Its use for not only prevention and performance, but also for treating injuries, has made it one of the most used tools in equine therapy for horses of all levels. When a performance horse experiences an injury, the goal is to effectively treat the injury with professional and expert treatment, and then to get therapy started as soon as possible. The longer an injury keeps a horse from daily movement, muscles degeneration will commence and the horse can injure other ligaments, tendons and tissues while compensating for the weak points. 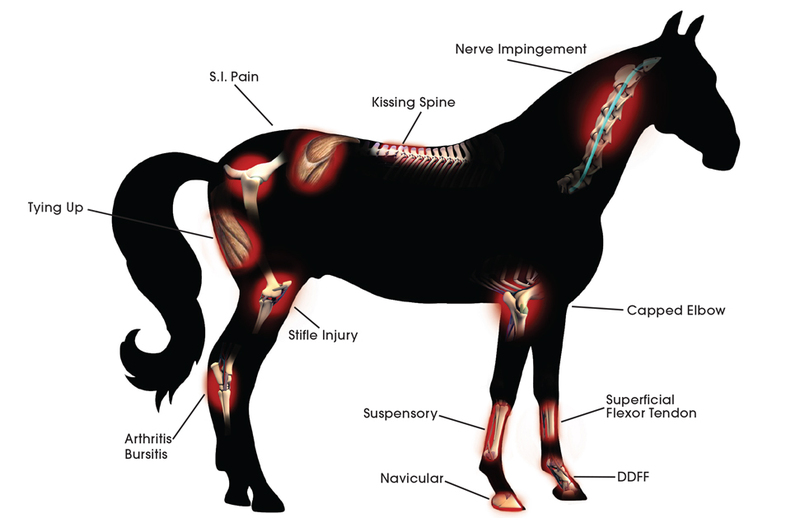 Laser therapy can not only help get the horse back into motion faster, but can also help reduce scar tissue and inflammation which can lead to further complications down the line. Laser Therapy is used on a weekly basis for prevention and in conjunction with massage and chiropractic sessions to help keep top-performance horses in elite condition. Acute conditions can be resolved with just a few treatments however it is not unusual for a chronic condition to require a number of treatments over a period of several weeks. Most treatments take from 15-30 minutes and are completely pain-free for the patient. In fact, depending on the condition, some horses experience immediate relief. Optimal treatment protocols are a direct result of the veterinarian or therapist knowing the horse and responding to that animal’s unique condition and needs. We do provide protocol guidelines and are available 5-days a week to answer any treatment inquiries as it relates to your horse’s specific condition.